Why do I constantly make fun of Gwyneth Paltrow? I can't help myself. Not only does she cook very well, and is beautiful, she just won best dressed at the Oscars. She has a website called GOOP, about fashion, food, trends, jewelry, and whatever else is perfect in her life. There's got to be something wrong with her. I have decided, I can't stand her. But I will happily post this fabulous easy recipe (originally from Jamie Oliver, though he uses beef, Gwynnie uses beets). Stacey uses almonds instead of pine nuts, since I am off pine nuts for a while (I've been reading too many awful things about them lately......). 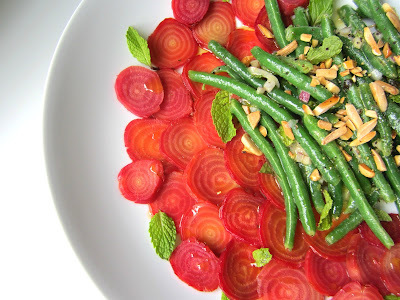 and, to also make this salad mine, I swapped in fresh mint, for the parsley and used candy striped Chioggia beets to make this the prettiest salad. You can assemble this salad ahead of time, which makes it the perfect dinner party dish. Roast your beets by placing your trimmed beets in a foil packet drizzled w/ olive oil and kosher salt. Fold up the packet tightly and roast for 45 minutes (depending on the size of the beets) in a 400F oven. 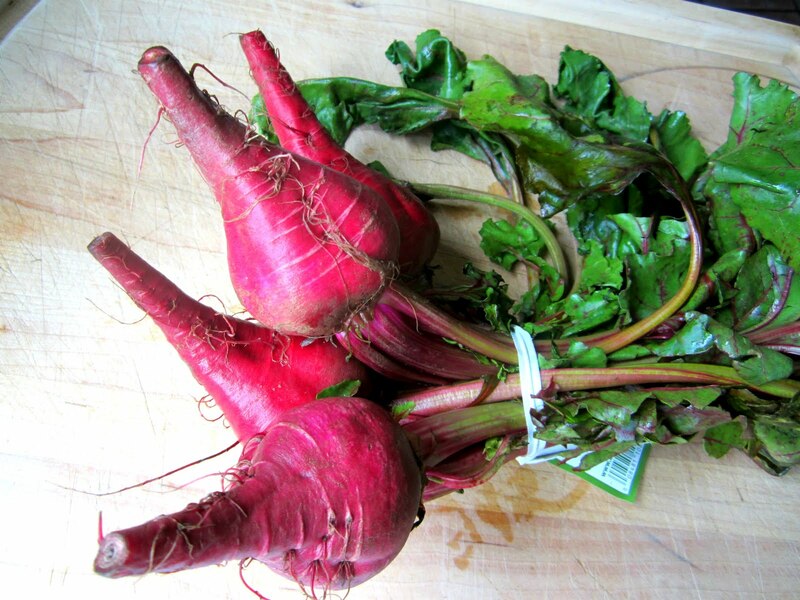 Let the beets cool. Once the beets are cool enough to handle, rub the skins off and slice them super thin, like a carpaccio. Lay in a decorative overlapping pattern on a circular platter. Cook your green beans in boiling water for 4-5 minutes and shock them under cold water to retain the nice green color. Transfer the cold beans to a bowl. Whisk the vinegar, mustard, oil, sea salt and pepper with the shallots in a bowl and pour over the bean salad. You can place the salad in the fridge for a few hours until ready to plate. Right before serving, place the marinated beans on top of the sliced beets and decorate with the toasted nuts and fresh herbs. This tastes as pretty as it looks. What a picture!!!!!!!!!!!! You are the champion food stylist/photographer besides being a great cook. What I brought to the annual potluck Oscar party we're invited to this year? Almond buttercake cupcakes w/dark chocolate ganache icing & toasted almond garnish, proundly flying a pretty, pink homemade flag proclaiming "I Hate Gwyneth Paltrow Cupcakes" & a picture of GOOP in the ill-fitting strapless gown she wore the night she won the Oscar for SHAKESPEARE IN LOVE. It's SO tough being Steven Speilberg's godchild. Some party guests got the joke, some didn't. One funny lady made me promise to make an "I Hate Demi Moore" tart for next year's party. All kidding aside, I truly hope Demi's in better shape by then! I know, and I hate her arms. Long, lean and nothing waving on the underside. Mine are getting there hauling three great danes around, but then I have a vivid imagination. 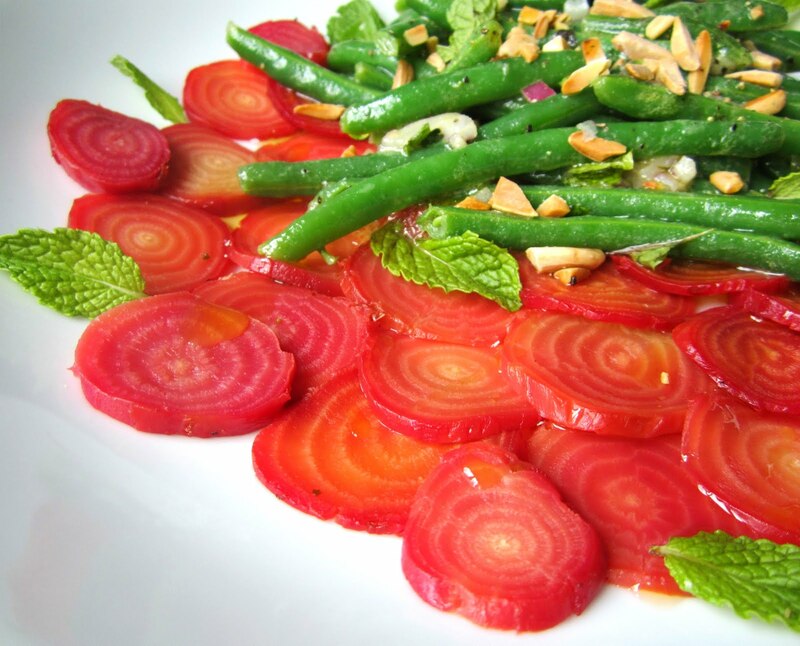 The beet salad looks yummy and I can't wait to make it. Thanks Stacey! This is way better than anything Gwynnie could come up with!